Argh! You lucky duck! OK, now, I want a full report on this event when you get back missy! 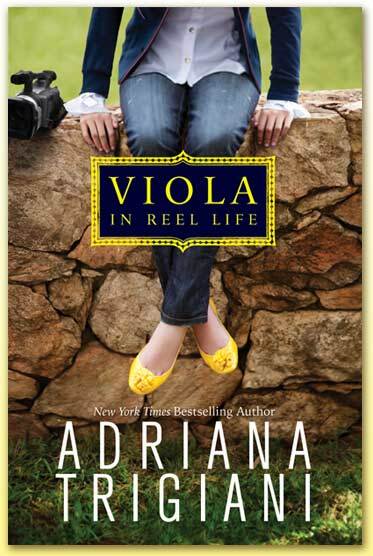 I loved Viola in Reel Life and can't wait to read Viola in the Spotlight. Maybe we can get the scoop on the book at the tea! Oh cool! So awesome that you will be having tea with Trigiani! I have loved quite a few of her books, and am looking forward to reading her newer ones. Please let us know how it goes and try to get some pictures. I would love to see them!! Have a wonderful time! Congrats to you on also getting to go to the tea! I have VIOLA on my Kindle to read. Looking forward to it! Oooh, I didn't know a sequel is coming out! I sped through this one on a flight a few months ago. I love YA fiction like this—with a relatable and quirky character. It's the same reason I liked The Disreputable History of Frankie Landau-Banks. Woo Hoo! We're going to have so much fun! I liked this book and thought it was very sweet. I'm looking forward to book 2 as well. Get you Lenore!! and how sweet of Daniel to get your books signed whilst you have lunch, you have a keeper! I loved this one! It's so cool you get to meet her - have fun! This book has such an awesome cover! I want her shoes. It sounds like a lot of fun! Definitely one to go on my wishlist. This is awesome...have a memorable time. Congrats on your win and thanks for the review. I've read plot summaries for this book and think that it sounds awesome. Can't wait to read it! Now you're just torturing me! I absolutely want to read this one, but my wallet is saying no. Well, at least I'm confident I'll probably enjoy it since I noticed I often have a similar experience to yours with the books I read! WOW, congratulations! It should be a great opportunity to win this metting! About the book, sounds very interesting! It's not so easy to find books about normal lives. It's good to get out of the fantasy theme once in a while. I love Trigiani and I'm so excited that you get to have tea with her. Hey, she just might give you the next one in the series!! Have a great time! How exciting- I'm so happy for you! I felt the same way you did about Viola in Reel Life. I am looking forward to book 2 as well. Have a great time in NYC! Thanks for the awesome review, Lenore - I really want to read this book after hearing so many great things about it! This sounds like a really good read. Have fun having tea with the author. Thank you for this review! I'm going to check this one out. And it's good to know if the beginning is weak and to not give up on it. I could really use a book on a normal teen living a normal life. There certainly are too many YA or women focused books that feature spoiled or mean heroines. Much Congrats. Adriana Trigiani did a signing at the bookstore I work at a few years back. She is a very nice person. Glad you liked it -- and that you're craving the normal teen with plot thing, because that's exactly what I've written, and I'm hoping more people agree with you! Anyway, this book (with its adorable cover) is on my TBR, and the review just bumped it up a few notches! Have fun at tea! That's so cool! I enjoyed Viola :) Hope you have lots of fun. what was the name of 'the lady in red'?? it was Mae something, help pleasee!! !